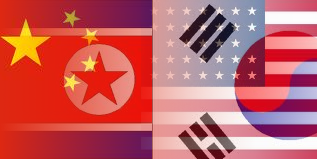 The situation on the Korean peninsula is amazingly tense, further escalations have taken things to the verge of war. All of the 15 UN security council members voted unanimously for tighter sanctions on North Korea (DPRK) (known as resolution 2094). In response to resolution 2094 North Korea has scrapped the ceasefire armistice agreement that was signed in 1953 by the UN, North Korea and China. The North went on to say that it had the right to launch pre-emptive strikes following on from foreign aggression. The scrapping of the armistice agreement leaves the Korean peninsula in a desperate situation and on the verge of war. This entry was posted in Anti-War, Daily headlines, North Korea, South Korea and tagged 1953 armistice agreement, Anti-War, armistice agreement, ceasefire, Democratic Peoples Republic of Korea, DPRK, korean peninsula, North Korea, north korea and south korea, politics, Republic of Korea, resolution 2094, ROK, sanctions, sanctions on north korea, security council members, South Korea, UN security council, war on 08/03/2013 by Leon J Williams.